Mint grows like a weed during the summer, so take advantage! Pluck a whole stalk and tear off the mint leaves. Before putting them in your pitcher or container, rip the leaves up in your hands to release the natural oils. Cover with water and chill overnight. When ready to serve, pour the water through a strainer and add ice. The result is cool, sweet water that leaves your tastebuds tingling. This infused water will have the slightest green tint to it. 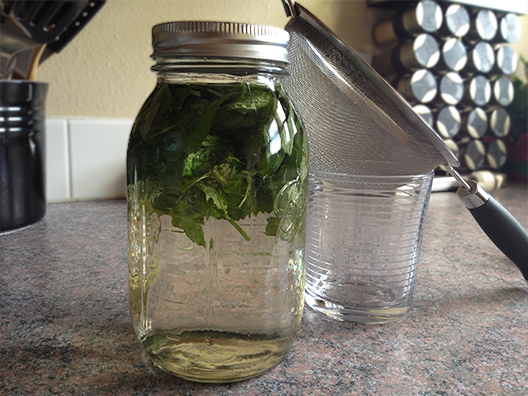 Recipe: handful of fresh, torn mint leaves combined with filtered water in a 32 oz glass jar. 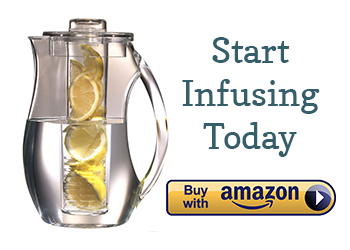 This water has so far been the best for me–a non-water person!